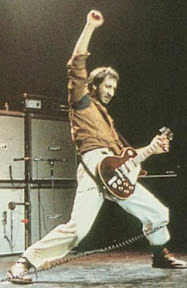 Smashing up your equipment on stage (as done by Pete Townshend) is one way to make your performance memorable, but may not be recommended for academic presentations. For many (most?) PhD students, there comes a time when they must present their work at a conference, meeting or workshop. The student may have already spoken about their work within their department, for example at a departmental seminar. I gave such a presentation as part of my MPhil-to-PhD-student status upgrade exam. In April, my time came to give a talk outside of Imperial. The abstract I had submitted had been accepted at the 22nd Annual Workshop on Mathematical and Statistical Aspects of Molecular Biology (MASAMB 2012) in Berlin. In the pub with Stephen and Bob I disclosed how nervous I was. With their wealth of knowledge and experience on the subject of giving a talk, they were both reassuring. However I felt I needed some practical pointers on the presenting itself. MASAMB 2012 Group Photo - where's Erika? My brother, Ant Cule (Hi Ant! ), has an MA in Theatre Directing from UEA, and now spends his time, among other things, doing stand-up comedy and directing undergraduates in award-winning productions. I figured he knew a thing or two about making a good impression in front of an audience. When I ran through my talk with Ant, his advice was so helpful, I wanted to share it here to aid other scientists preparing to present for the first time. If you also find Ant’s advice helpful, you can get in touch with him on Twitter – as well as helping me out, he has experience coaching presentation skills in a professional capacity. It’s likely the most memorable scientific talks have had the ‘spirit of performance’ about them because they address the audience. This means making eye contact, asking questions, and giving the audience time to digest the information you’re giving them. I’ve found that performers, and particularly young students, try their best to forget the audience – to try and block out the fact that they’re on stage with everyone looking at them and listening to them. Yes, this definitely sounds familiar! Well, whilst this may seem a safe place to be, you must remember that an audience wants you to succeed. Why would they spend their money or time if they didn’t? So much of theatre seems to me to actively avoid acknowledging the existence of the people watching: etymologically, the word ‘audience’ has the same root as ‘audio’ – ‘audire’ meaning ‘to listen’, whereas ‘spectators’, for example at a sporting event, come from the Latin ‘spectare’ – to watch, same as ‘spectacles’. But, as far as I can see, there’s no getting away from the fact that a play is performed or a talk given in front of people, so why not acknowledge them? That’s a good point – when preparing a talk I am so focused on how to best present my results that it is easy to forget the importance of the other participants at the presentation. In terms of practical advice: if you have to have notes with you, make sure you don’t bury your head in them – look up and give your audience a smile. Move around, give them something to look at. You want them to engage with what you’re saying, so engage them. Generally an audience will want to work, to engage with you, but you can’t expect them to do all that work for themselves. You will be presenting material you’ve read, rehearsed and studied a trillion times, and in all likelihood it will have lost a lot of its sparkle for you. Remember, this is the first time your audience has heard or seen this particular material. Recall and reconnect with what it was that first drew you to the material. Find what it is that excites you about the material and share that with the audience. Connect with what you’re saying as you say it. As long as you’re interested you will be interesting (and this is an important distinction: be interested, but do not under any circumstances be interesting, it will invariably be tedious and painful). Let them take in every point: I know you will probably want to get it over and done with, but take your time. If you give off the impression you want to get it over and done with, you will give off the impression that what you’re saying isn’t worth taking in. I think that most scientists will have seen their fair share of `tedious and painful’ talks, and you are right that one common feature of good talks is that the speaker is genuinely excited by their research. Exactly! It is worth watching carefully what others do, and noting what works. You can feel when everyone in the room is hearing what is being said, and when everyone switches off. Don’t fall into the trap of doing what’s safe. If everyone at the conference has started at the lectern, then start on the other side. Start in a chair. Start in the audience. Do whatever it takes to snap people out of ‘audience mode’ – sitting back in their chairs, tapping their feet, shuffling about. Audiences will only do this if you’re giving them what they’re used to. Cruel though it may seem, note when your peers bore you – look at what they’re doing, and don’t do it. To conclude, remember there are people watching you, and they want you to succeed; stay interested in what you’re saying; take your time; watch others; and finally, don’t let them be an audience. Make them spectators. I was very nervous about giving my first talk, as you saw when I ran through it. This had a big effect on my presenting style. What exercises can a nervous speaker use to prevent their anxieties from affecting the communication of their work? You can see how the manipulation of the actors’ breath heightens the tension. At around the 23 second mark we get our first encounter with the humans, and note how as the camera pans to them they’re speaking in whispers, holding their breath and their shoulders are up. If you pause on 29 seconds, you can see this especially in the young boy. At around 50 seconds the girl sees the velociraptors which is followed by a sharp intake of breath, which she doesn’t release. Subconsciously audiences will tend to hold their breath with the girl, which heightens that indefinable sense of tension. As the scene goes on you can notice the actors only breathing being extremely shallow, particularly in close ups. Your breathing will probably follow suit. Note also, how the breath is released along with some of the tension at the 1:25 mark, when the raptor sweeps a load of cook-wear onto the kids. Then the tension is ramped back up with the holding of breath, until it’s all released in the breathless climax of that scene – which is delivered through a series of screams, which are exhalations, and thus releasing the tension. You are right – it’s very difficult to watch this scene without being caught up in it yourself. But, how can a speaker use this to their advantage? Take a deep breath, feel the tension in the upper body and head. Then, let the breath out through your mouth, and feel that release and relaxation. Keeping your shoulders down and relaxed and throat and head nice and relaxed, breathe in again – you should feel the breath arrives somewhere deeper, somewhere near your stomach (you may find you resist this; just relax your stomach muscles and let it all hang out – it’s just your diaphragm squishing stuff down). The breath sits very comfortably down there. Practise getting your breath down there and keeping it there. I say ‘keeping it’ rather than ‘holding it’, because holding it has all those associations we want to get away from. ‘Holding your breath’ implies tension and struggle. ‘Keeping your breath’ implies control on your part, and comfort. To keep your breath in your stomach, relax your shoulders and stand up tall. Your throat will probably constrict because it’s used to this, but be aware of this, and relax your throat. It’s a feeling that’s hard to describe when you can keep your breath in your stomach. Imagine your stomach is a balloon, and you don’t have to do a lot to inflate it. Once you’ve found you can keep your breath in this ‘balloon’, you’ll notice your shoulders, throat and jaw are relaxed. This is perfect; you’re able to breathe comfortably whilst staying relaxed. You will instantly look at home in front of an audience. Tension will also manifest itself in speed. This links to my earlier point about giving the audience time to take in what you’re saying. A simple way to help yourself if you find yourself talking too quickly is to, after every sentence, stop and take a reasonably big breath in and out. When you rehearse, it’s worth doing for the whole talk, because it will get you to relax regularly throughout, and will encourage you to think about what you’ve just said and what you’re going to say. Remember, if you seem to be rushing, it will be assumed what you’re saying isn’t worth paying attention to. If you want to explore the power of breathing in performance further, I strongly recommend Cicely Berry’s Voice and the Actor. Lastly, there is some discussion among scientists of Impostor Syndrome – see this article at Nature Careers and, closer to home, this blog post by my fellow OT blogger Athene. Does impostor syndrome occur among actors? (If so, in that case do you call it impostor impostor syndrome?) Because acting involves “being other people”, are there techniques from acting that impostor syndrome sufferers can use to inhabit the successful persona they far from feel? Oh yes, of course it occurs with actors. When you’re on stage there’s always a voice in your head saying ‘You don’t know your next line, by the way…’. The same in stand up: ‘They won’t laugh at this, by the way…’. The main thing, really, is knowing that you do belong there, and you deserve to be there. You know, really, how hard you’ve worked to be in that position. Thanks Ant! It sounds like thinking about your audience at both the writing and the presenting stages of a talk could yield improvements in both your confidence and the clarity of your presentation. I hope these have answered the questions, and please do get in touch with me to clarify stuff if it doesn’t make sense. I hope that my input is useful to you, and your fellow PhD students, and I look forward to seeing your next talk! This entry was posted in PhD and tagged drama, giving a talk, Jurassic Park, PhD, presenting, Siblings, The Who. Bookmark the permalink. I’m assuming your talk went well then Erika? Ooh, some nice tips there. The “do something different” suggestion is a good one – especially if you’re late on in the session. I’m giving a talk next week (about fossils, but not Jurassic ones), so I’ll have to think about trying that. I wonder if I could give the talk dressed as a velociraptor. See how the audience breathes then! Alas my velociraptor costume got lost in the post, so I could only wear it for the banquet (great for getting ber from the bar, even better when they didn’t ask for money). I was last up in the session, so I did something slightly different. Everyone had been standing in front of/next to the computer to talk. But there was a dias in front of the screen, which was about 3m from the floor. So I stood on the dias: easier to see everyone, but less easy to see the computer. My slides weren’t content-rich so I could glance down at the computer screen, and spend the rest of the time looking at the audience. It was actually quite liberating to be so far from the slides: it freed me up mentally, and people seemed to enjoy the talk. So, thanks Ant, for the tips. I think I owe you a beer.